From the showtime-evocative energetic start to the complex interracial love story which brings it to closure, The Astounding Antics of Anthony Ant, written by Natal University’s Pieter Scholtz in 1985 during the thick of apartheid, sees light of day with a freshly painted coat of rhetoric that sharpens and refines political bluntness, hypes up the entertainment factor and yields a production completely devoid of weakness. Director Francois Theron accompanied by a production team of heavy weights in the industry, including set designer Stan Knight, choreographer Shelley Adriaanzen, lighting specialist Jane Gosnell and costumier Sarah Roberts, introduces a fabulous group of mostly new talent, and the story is funny and friendly and delightful without being too saccharine or scary. The beauty of using a story without a European history of performance is that it retains freshness that will hold even the grown-ups enthralled. The hilarity stakes are raised with the interjection of the ‘ant’ prefix or suffix in the oddest of places, which even the grade one learners with whom I saw the play responded to beautifully: Miscre-ant, Arrog-ant, Observ-ant, Assist-ant, Ant-teek, Sybil-ant, are just some of the characters populating the show. Handled with gentle authority, the play is given the credibility that it warrants as a part of a serious theatre genre. From antennae to toe, it’s a tight ship of a show, from which you come away with great satisfaction. Featuring music ranging from contemporary song Jika by Mi Casa, which gets the littlies jiving before the action even begins, to a gentle corruption of Bob Dylan’s ‘Mary Ann’ (1973), there’s true magic here. Focused on the comings and goings of ant life, which slur a bit from the truths of the biological dynamic of an ant colony, including the presence of a queen and the gendered nature of workers, we meet the eponymous Ant-hony (Matthew Berry) (pictured), who encounters an old ant, a yellow ant, a mad aunty and several baddies in the tale which is focused on saving the world, eradicating evil and falling in love: all the good stuff that makes it worthwhile. And every performer in this cast of eight deserves a special mention: but it’s the one throwaway line in the racial tussle central to the plot that encapsulates it all. While everyone condemns Mary-Ant (Suzaan Helberg), the tale’s romantic interest as a yellow ant, Ant-hony realises with true boyish charm that she’s actually a girl, which is of far more weight than the other prejudices. 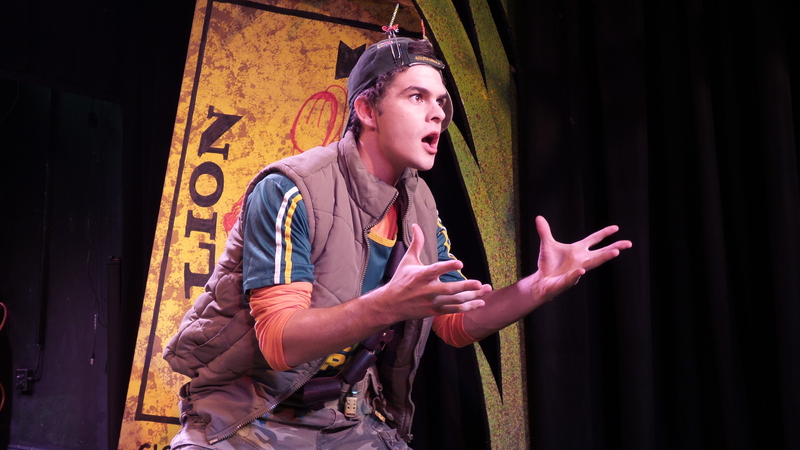 The Astounding Antics of Anthony Ant, directed by Francois Theron, performs at the National Children’s Theatre, Parktown until May 4 (011)484-1584.